It takes input files from cameras that have been converted to monochrome. It then saves it as “truly” monochrome DNG files, suitable for using with popular converters that support the DNG format (that is to say, almost all of them). 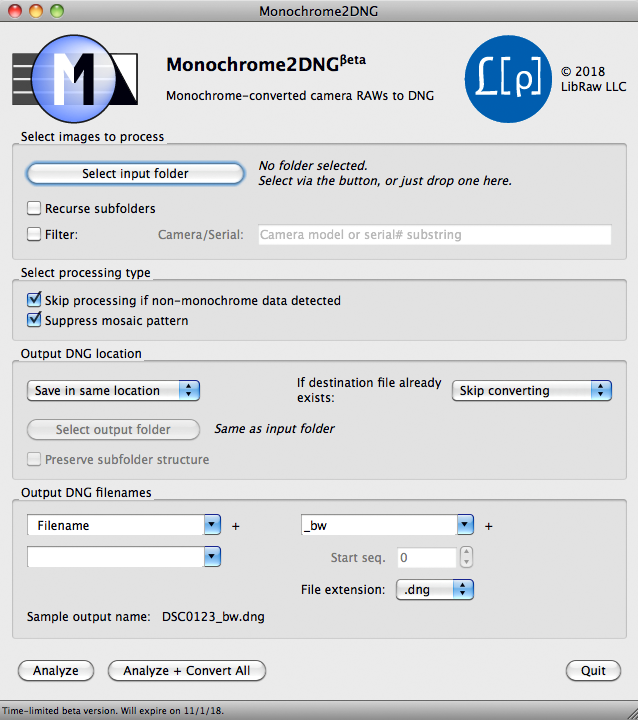 One can turn on automatic “monochrome” recognition and convert only the files from converted cameras (so one can process a large archive that has both color and monochrome files in it quickly, in one pass). Several formats for output DNG are supported, which allows one to use their RAW converter optimally. Filter input files by Vendor/Model/Camera serial to process large archives faster. Monochrome2DNG is trialware (shareware): you may use it for free for 30 days (no limits, no watermarked images, trial version is fully functional for 30 days). After that period you'll need to purchase license. Monochrome2DNG doesn’t have any specific settings for separate cameras. All cameras with Bayer or X-Trans sensors that are supported by the LibRaw library should be supported. Almost all digital cameras that are released today are color cameras. Several Leica and PhaseOne models are rare exceptions, but these cameras are even more of a niche product than the color cameras or digital backs made by those same companies. Nevertheless, there is demand for BW (Black and White) cameras (for reasons explained in detail below), and many photographers want BW cameras with the same lens mount as their main (color) camera, so that they can use the lenses they already own. Since a color camera differs from a BW camera due to the existence of color filter array (CFA, Bayer mosaics) over the sensor, converting a color camera to BW is done by removing the CFA*. After the CFA is removed, the demosaicking process that is done during RAW file processing becomes unnecessary. This, in turn, leads to higher resolution and a decrease in the number of processing artefacts (see the Bayer Moiré article), which is, essentially, why people perform the conversions of color cameras to monochrome. The monochrome file recorded by the camera cannot be told apart from a color shot without a complete analysis of of the RAW data – all of the metadata corresponds to the color file. In many cameras, sensor data is processed differently for different color channels before the RAW is recorded (for example, White Balance preconditioning for Nikon: the values of the red and blue pixels are multiplied by small coefficient). In the case of a camera converted to monochrome, equally exposed pixels that originally, before conversion, belonged to different channels, receive different RAW data numbers. 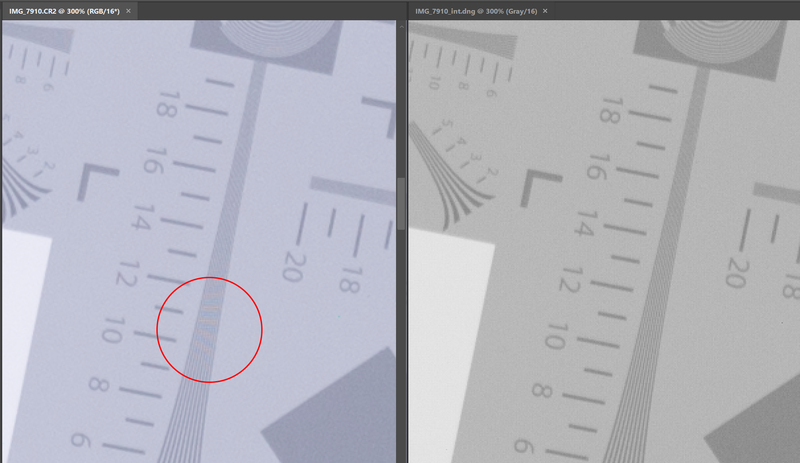 The first problem leads to most RAW processing programs continuing to think that they’re processing a color file and, accordingly, preform demosaicking, which leads to resolution decreases, moiré, and aliasing. The image below shows the same shot taken with a Canon 6D (converted to a monochrome camera) and processed by Adobe Camera RAW 10.2. 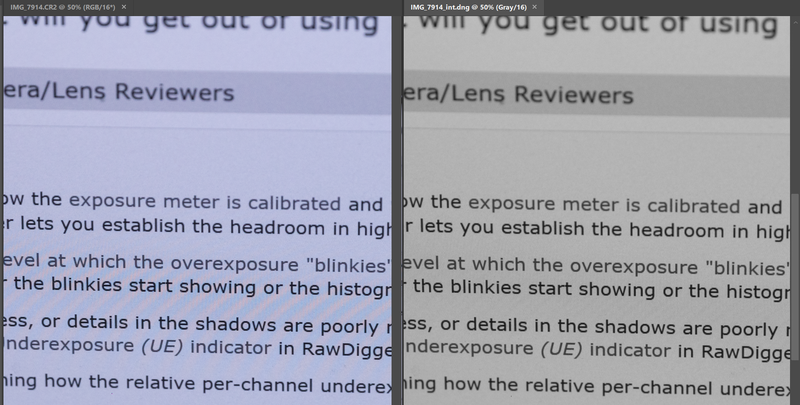 On the left, it’s been processing like a color file (ACR will do this “by default”). 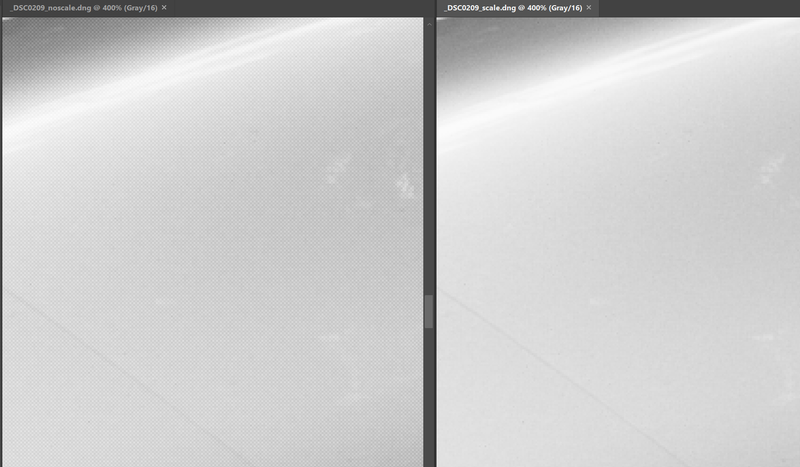 On the right, the same RAW data, but ACR has read it as monochrome. Various programs, including RawPhotoProcessor, AccuRaw Monochrome, and darktable support processing “without demosaicking” (not all of the listed programs can automatically suppress mosaic artifacts), however it’s impossible to use more popular RAW converters (Adobe Lightroom/Camera RAW, Capture One, DxO, etc.) normally with files that have been recorded by cameras converted to monochrome: the above-described problems will appear. Such conversion is done both by specialized companies (Llewellyn Data Processing (LDP) LLC, Cooled DSLR, Monochrome Imaging Services, HyperCams and Mods), and by individual enthusiasts.